At 10.21 p.m. on Christmas Eve 1953 the Wellington–Auckland night express plunged into the flooded Whangaehu River at Tangiwai, 10 km west of Waiōuru in the central North Island. 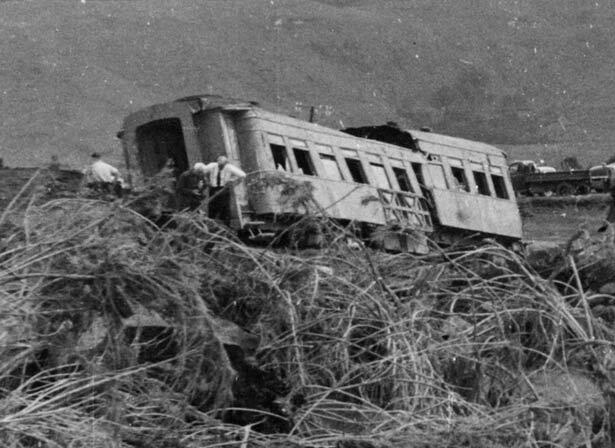 Of the 285 passengers and crew on board, 151 died in New Zealand’s worst railway accident. It was, at the time, the world’s eighth-deadliest rail disaster and made headlines around the globe. The nation was stunned. With New Zealand’s population just over two million, many people had a direct relationship with someone involved in the tragedy. The place name Tangiwai means ‘weeping waters’ in Māori. The timing of the accident added to the sense of tragedy. Most of those on the train were heading home for Christmas, armed with presents for friends and family. Those waiting to meet their loved ones at the various stations up the line had no sense of the tragedy unfolding on the Volcanic Plateau. Over the following days, searchers found many battered, mud-soaked presents, toys and teddy bears on the banks of the Whangaehu River. We have 1 biography, 16 articles, related to Tangiwai disaster.